Filler metal cost is often a very small percentage of a project budget, however it can have a profound effect on the success of that project. Help yourself and your company reduce that nasty four letter word – RISK. Since 1995, Euroweld has prided itself in supplying high-quality welding alloys. Our products go beyond simply meeting an AWS, ASME or many international specifications. We are able to apply our experience and knowledge in the formulating and processing of welding alloys to give our products chemical, mechanical and operating characteristics that are second to none. Working with our suppliers and manufacturers that share our same values for quality, we do everything possible to ensure a quality product reaches our customers. In addition, many of our customers have found our "Value Added" technical knowledge in welding applications, processes and materials to be invaluable – something most filler metal suppliers cannot provide. Most of our alloys are sourced from the United States or Europe, avoiding materials of questionable quality or origin that is becoming common from other parts of the globe. In accordance with many Customer requirements, Euroweld prohibits products to be sourced from Conflict Countries. 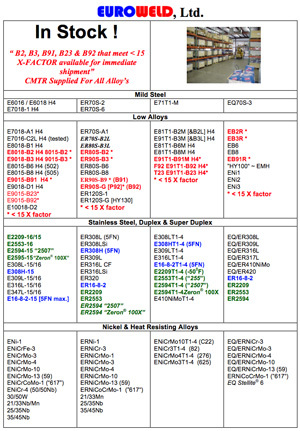 Each alloy is also accompanied by a Certified Material Test Report (CMTR) that shows actual chemistry as a minimum in addition to standard specification requirements. Special testing can be performed on any materials if desired by the Customer. Euroweld has two fully stocked, ideally located warehouses to best serve its customers. We believe it is critical to have the highest quality materials on-hand for you. A very large and well-known petroleum company was in the planning stages of a large project that required a specialty welding alloy. This alloy had previously been manufactured by a well-known welding alloy manufacturer for this specific petroleum company. However, due to low demand and relatively high cost of the alloy, the manufacturer discontinued the product.